A picture is worth a thousand words. 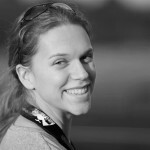 So how can animal movement and landscape structure be translated into a great graphic? 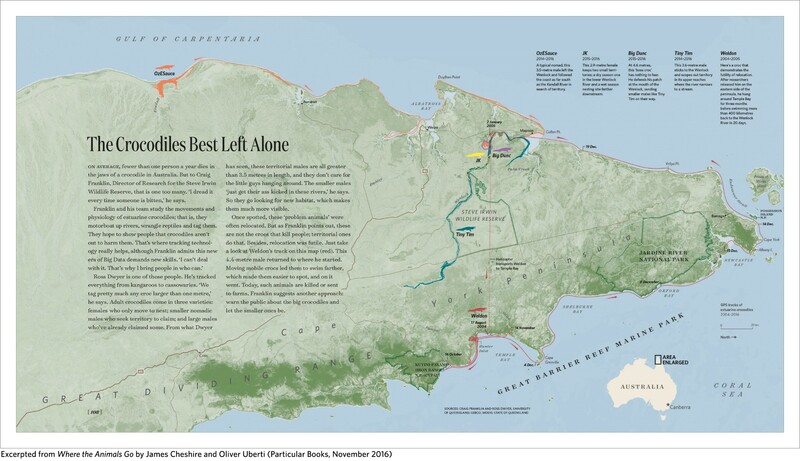 By looking beyond conventional figures and letting these maps be an inspiration to think big about corridors, connectivity, and habitat fragmentation. If you know of other great connectivity maps, email us corridor@conservationcorridor.org or on Twitter @conscorridor. Created by Dan Majka and The Nature Conservancy, this map shows the average direction that mammals, birds, and amphibians will need to move as they shift their ranges due to climate change. Based on coarse 50 km data, the map reveals general key corridors across both North and South America. The animation is based on flow models from circuit theory and a foundation in previously graphed wind maps. Ever thought about how a metro system is like a corridor network? 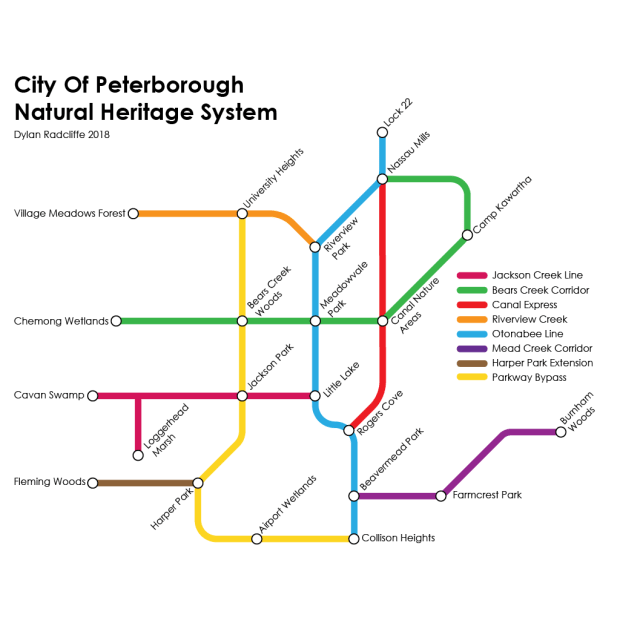 Dylan Radcliffe took this comparison and made it a reality by creating a map of the natural heritage system as a transit network for wildlife in the city of Peterborough, northeast of Toronto. Egyptian vultures are an endangered species that migrates between northern Africa and southern Europe via Asia. Maps of individual migration routes, created by Evan Buechley at the University of Utah, reveal flyways along the Red Sea and Sinai Peninsula that allow the birds to travel thousands of kilometers. Proposed reductions to Bears Ears and Grand Staircase-Escalante National Monuments in Utah show the potential loss of connectivity that would result from protecting only the remnant pieces. This map from The Wilderness Society captures the landscape changes that would turn two large protected areas into several disconnected fragments. In their recent book Where the Animals Go, James Cheshire and Oliver Uberti translate data from nearly 40 studies into 50 maps and graphs that highlight animal movement around the globe. The maps reveal stories about how animals move through connected (or disconnected) landscapes, and include paths from a diversity of species including terns, bees, and crocodiles. Migrating birds rely on flyway corridors to move between breeding and wintering grounds. This 365-day map from the Cornell Lab of Ornithology tracks 118 species of birds as they travel across North and South America. The aggregation of individual dots from millions of observation highlights migration patterns and bottlenecks that are common across multiple species.